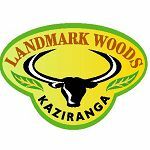 Landmark Woods is a part of Landmark Tours & Travels Company and is located amidst lush green forest in between the Burrapahar and Bagori range of Kaziranga National Park. Landmark Woods is 5 hours away from Guwahati in Assam. An international standard resort, Landmark Woods has amenities that include 25 well appointed luxury rooms of one category, air-conditioned rooms with en suite toilets, 24 hour generator back-up, running hot and cold water, digital TV, minibar and hot kettle. Other amenities include a swimming pool, Joe Public-the multi-specialty restaurant, Malana Cr me-a well stocked bar, Commune-the video room to view wildlife videos, billiards and pool table, table tennis, carom, dart board, etc. The hotel also has conference facilities with two conference halls for either a small meeting comprising of 20 people or a huge gathering of 200 people. Other activities in the resort include boating, fishing, pool games, tandem biking and barbeque, etc. Outdoor activities include bird watching, treks, elephant, jeep and boat safaris, tea garden visits, and day trips to the Ahom ruins in Sibsagar and village visit.